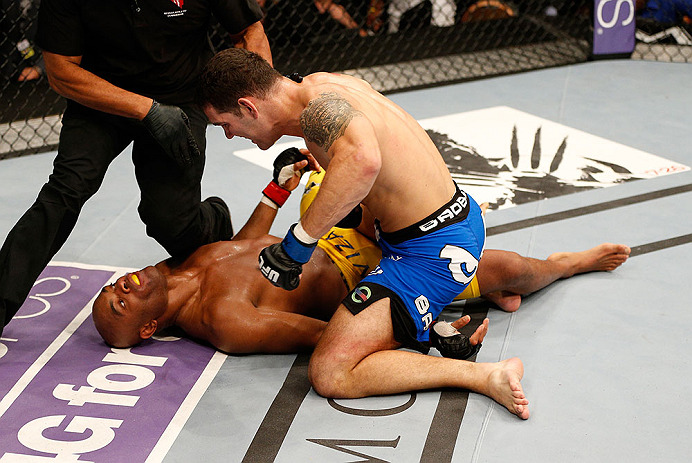 I was a little shocked, and perhaps a little disappointed to see Anderson Silva lose to Chris Weidman on UFC 162. When Weidman took Silva down, Silva got up but was perhaps hurt a little more than he expected. Silva showboated as usual, goading Weidman in a stand-up. Weidman played into it a little since he completely stopped takedown attempts, but Weidman was ready for the showboating and was relatively calm. Since Weidman didn't play into Anderson's counter-strike reliant strategy as expected, the showboating escalated. So I don't see a rematch playing all too differently, although the results may vary. Maybe more takedowns by Weidman, maybe some but less showboating by Anderson, maybe another adrenaline dump by Weidman, maybe a more successful first-strike game by Anderson (a la his Franklin and Henson fights). But then again, I thought Anderson was going to decimate Weidman, so what do I know. Wade Keller at MMATorch.com - "Trying to figure out what was going on in Silva's head during the fight and how he'll react tomorrow when he wakes up without the belt"
Dave Meltzer at MMA Fighting.com - "Where UFC 162's finish and Anderson Silva's streak rank in all of MMA", with the similarities and differences between Fedor's win streak and subsequent end against Werdum. Dave Meltzer at MMA Fighting.com - "Fortunes changed for five at UFC 162", with perspective on Silva Weidman II.